They may be hard to find on times, but they are essential pieces of equipment in all multi-storey buildings. We’re talking, of course, about lifts or elevators for people, and service lifts for goods and freight. Lift systems require a hoist motor and a winding system for the cables that raise and lower the cabin for people or freight. Ever since the late 1800s, safety systems have also been provided to eliminate the greatest of all risks connected with lifts, i.e. the risk of a cable breakage and cabin fall. Today these systems generally take the form of speed limiters and parachute devices. To keep operating risks as near as possible to zero, lifts have to be subjected to regular and meticulous maintenance. This involves the reconditioning of the entire system in order to eliminate all worn mechanical or hydraulic components and prevent failures that could possibly lead to accidents. 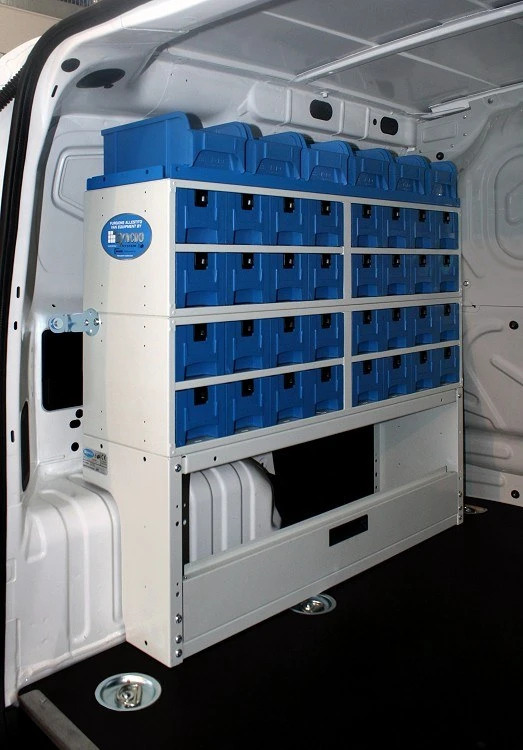 The specialist technicians who perform this work need a functionally equipped van to transport all the equipment and materials they require for servicing, minor adjustments and repairs, to the building, condominium or company where the lift is installed. 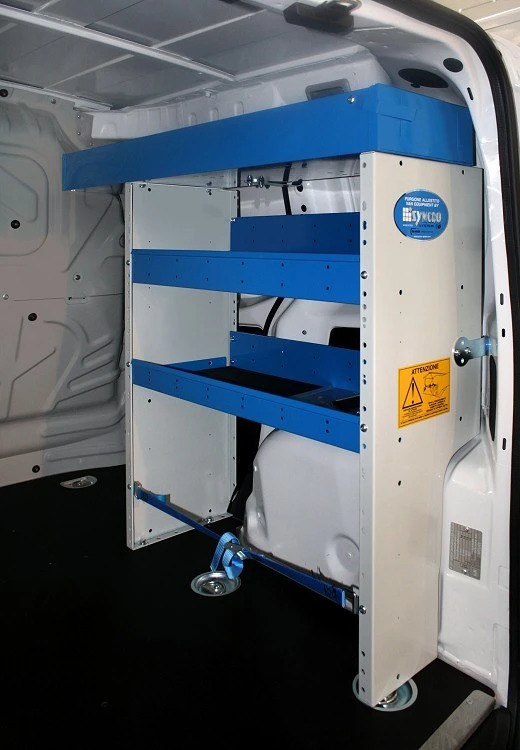 Upfitting a van for lift technicians is a piece of cake for Syncro System. All possible requirements can be satisfied thanks to the highly modular design of the Syncro upfit system, and superb functionality and a stylish finish are guaranteed too. Let’s see what combination of units was chosen for this Syncro System upfit for lift technicians. The first step in the upfit of this light commercial, even before the storage units were fitted, was the installation of load compartment lining. It was particularly important to protect the floor, so panels of resinated plywood were cut to size and installed. Resinated plywood is extremely effective as a floor material because its structure of wood layers and phenolic adhesive guarantees excellent resistance to wear and even high levels of humidity. A top coat of resin protects the plywood underneath and also provides a non-slip surface, something that is essential to the safety of operators moving around inside the van. Note also how the various sections of floor panel have been cup-drilled to provide easy access to the van’s original floor anchor points. This might be a small detail but it is typical of how Syncro System caters for customer needs. This particular van, operated by a lift installation and service company, is not a large vehicle. It was therefore particularly important to make full and rational use of all available space. Let’s see how it was done. Left side. Storage on this side of the vehicle is provided by a large wheel arch unit with an access door at the bottom. This creates a space capable of holding even large items in an area that would otherwise be difficult to use. 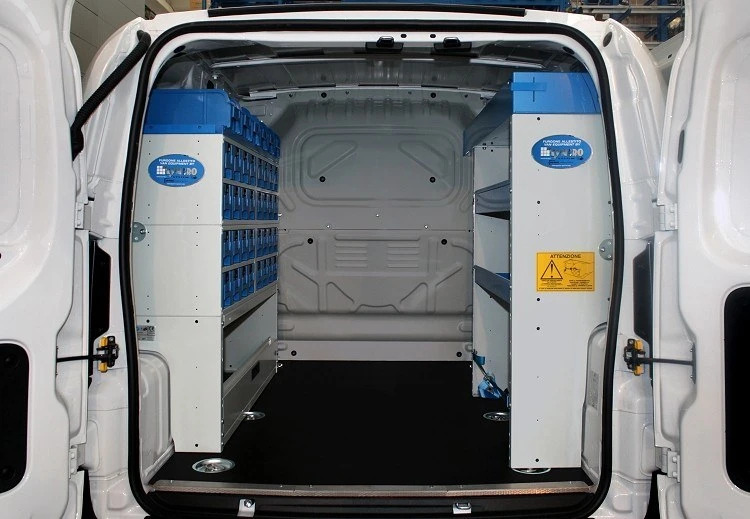 Over the wheel arch unit, two Multibox cabinets with 32 removable plastic drawers have been fitted. Labels can be added to all the drawers to list contents, allowing everything to be located instantly when needed. The top section consists of a shelving unit with stops for large, removable containers. Right side. 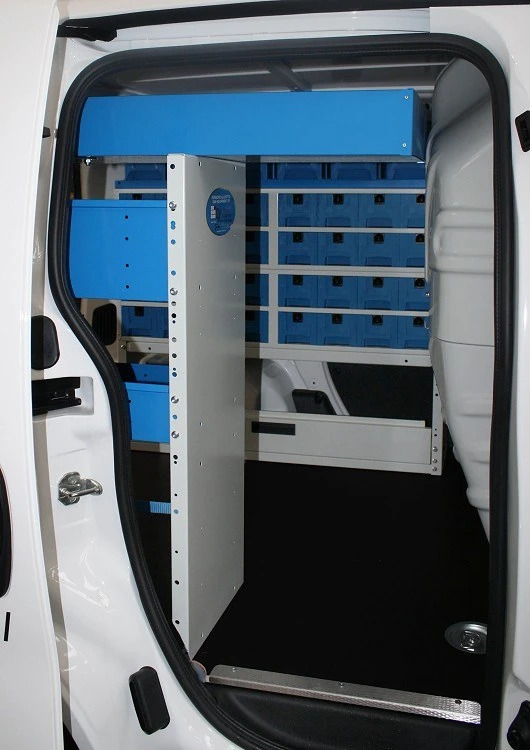 More shelves are provided on the right side, where the van’s side door is located, over an open wheel arch unit equipped with a strap and hook lashing system. The three top levels on this side consist of shelves with anti-slip mats, in which metal dividers can be installed as needed.